I restrained my eye roll up until "Mike Smith is an overrated jockey." Entered in race 9 on the 23rd at Del Mar. Turf. Entered in race 9 on the 23rd at Del Mar on the Turf. Two horses that make me sick to think about, simply due to their unfair fates - Lost In The Fog and Star Over The Bay. Still makes my stomach turn. RIP Ben's Cat. How awful he was only able to enjoy retirement for a month. My thoughts are with his connections, current and former. Amazing shot of Songbird and a songbird... by a beak? BaroqueAgain1 wrote: I've always thought Gormley looked like a tank, but IMO the low NBC camera angle during the post parade makes everyone look short-legged. I will say that he's got a neck like a powerlifter. He is quite short and stout in person. Thanks to Fox Hill Farm's generosity, I won two tickets to sit with Victoria in box seats! 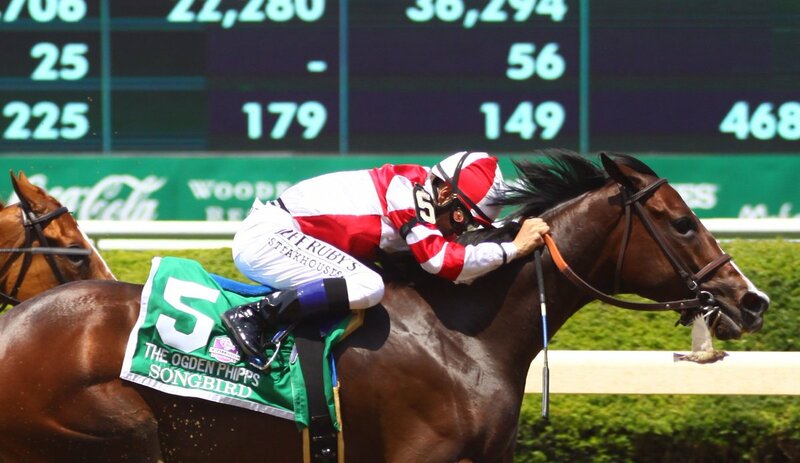 I'll also be able to be in the paddock for Songbird's race, and the Winners Circle should she win!!! Unbelievable!!! I just landed in Toronto and in tears.